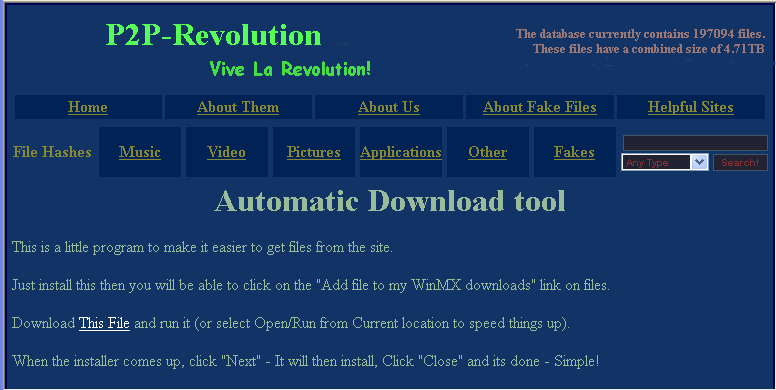 The P2P Revolution WinMX hash listing site is a simple to use database of many file types that was compiled to ensure users could pick out real files from fake files by using the hash search feature that is available on the WinMX Client. Lets gets started, first we need to visit the site itself, lets go there ! Now is the time to install the special Download Tool that gives a seamless touch to the whole operation and makes everything very smooth to use, you will only have to do this step once as the tool will only require to be installed once. 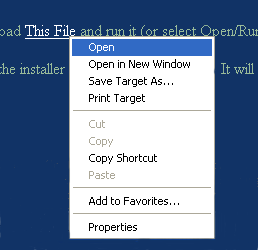 You can also select "Save As" and scan with your anti-virus software first before installing if your worried about the program. Ok, thats the hard work done, with the tool installed you can now move on to the easy bit. You will need to have WinMX running for this to work correctly, start it now if it's not running yet. Select a file of your choice by using the search tool or manually browsing the lists, and click on the link. 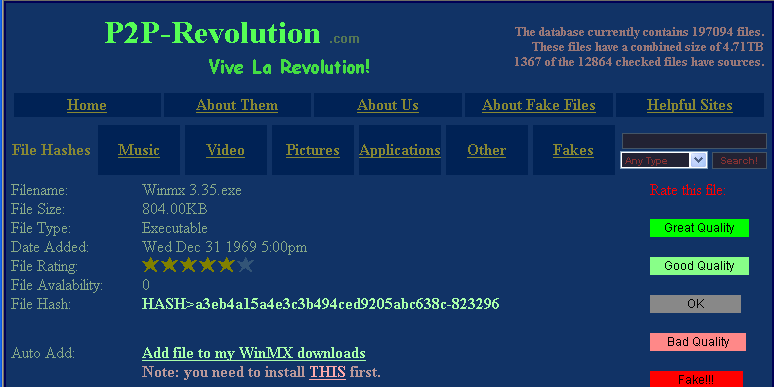 You can see on this page the files rating (5 stars is excellent) along with the size, and WinMX hash, if your happy with the selection continue to download the file information by simply clicking on the link shown. Now comes the moment of truth, although you probably noticed nothing happening a quick check of your WinMX Transfers window should show some activity. Once a matching WinMX hash is found the download will start automatically. I'm sure you will agree it cannot be simpler than this, you need only click on the files you require and wait till they are located, as mentioned previously, there is no need to reinstall the download tool again. Cheers to the folks who operate P2P Revolution.